...and it's a 1 in 3 award! It's from Lynn's Chic Spot and Madz of My Life Journey to Success. Thanks much, ladies. I have a million too that I still have to do. Golly. I can't keep up. I have to post them otherwise I'm doomed, lol. Anyway, no plans this weekend other than finishing laundry. WHat's new eh? You have a great one too Miss. How's your weather? It started 40 here but it's now 59, I guess that's not too bad. Thanks for the visit Mommy J! Hope you too have a fun filled weekend. 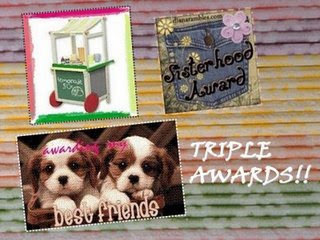 Hiya mommyJ, you deserve these awards!,, and your acceptance of friendship mean a lot to me... I do treasure the kind of bond we have made here in blogging world!.. Thanks for grabbing my tag.. mwha mwah mwah and how was your weekend otherwise?